A. A. Farland Black Beauty Model 5 String Banjo, c. 1915, made in Plainfield , New Jersey, black varnish finish, maple rim, poplar neck. A.A. Farland, A celebrated banjo virtuoso of the late 19th and early 20th century, didn't care for those new-fangled tone rings banjo makers of his era were using on their high-grade instruments-- he thought they sounded "too tinny!" He also abhorred spun-over metal rims, like those on S.S. Stewart's banjos, for the same reason. Farland preferred a plain wooden rim with no metal at all and so designed and patented his own banjos with no tone ring whatsoever - just a wood rim sloped away from the outer edge. He called it the "A.A. Farland Beveled Top Wood Rim Banjo", putting a label inside to that effect with his picture in the center. As he was primarily a teacher and performer he didn't actually build the instruments bearing his name-though he may have had them assembled at his studio in Plainfield- but subcontracted with the best builders of the day. 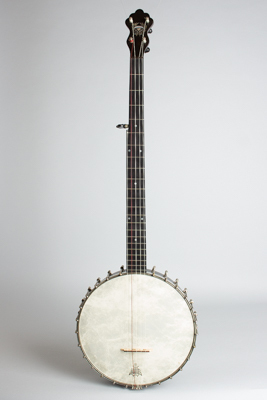 This particular example uses components almost certainly made by New York's Rettberg and Lange, and shares many family traits with their more common Orpheum banjos. The "Black Beauty" was one of Farland's rare budget models-most Farland instruments are actually higher-end performer-grade models. Intended as a student-grade model, it is built with simple hardware on a plain black lacquered neck and rim, with Farland's beveled rim and proprietary mute system. There is a delicate pearl inlay in the headstock. A beautiful delicate metal tailpiece marked A.A.F. Pat. And a label on the dowel stick reading "Black Beauty, A.A. Farland manufacturer Plainview NJ. While this particular example is very clean it is not a great playing instrument, but it is a neat piece of banjo history. Overall length is 37 in. (94 cm. ), 11 in. (27.9 cm.) diameter head, and 2 3/4 in. (7 cm.) in depth, measured at side of rim. Scale length is 27 in. (686 mm.). Width of nut is 1 1/4 in. (32 mm.). This intresting banjo is in extremely fine cosmetic condition, showing very little wear for a 100 year old instrument. The finish has some light dings but both the black lacquer and the nickel plating are still shiny and clean looking. All the hardware is original and intact except some of the moving parts of the elaborate mute system are missing, so the mute is not functional. The neck is made of extremely light wood with a very thin fingerboard and shows a fairly significant bow that is not easily correctable without altering the instrument seriously. In view of the rarity of this banjo we have elected to leave it as it stands in its original state. The banjo is currently strung with NylGut classical banjo strings and is playable in a minstrel or frailing style with the action set at 3/16" at the 12th fret-it actually sounds quite good with a predictable woody tone. While we usually repair instruments to optimum playability, in this case we are offering this banjo As-Is due to its historic value. Unrestored. Overall Excellent Historic Condition.